More from the Salem Music Center: Q&A with the Kids | The Only Democracy? Israel. The only democracy in the Middle East? 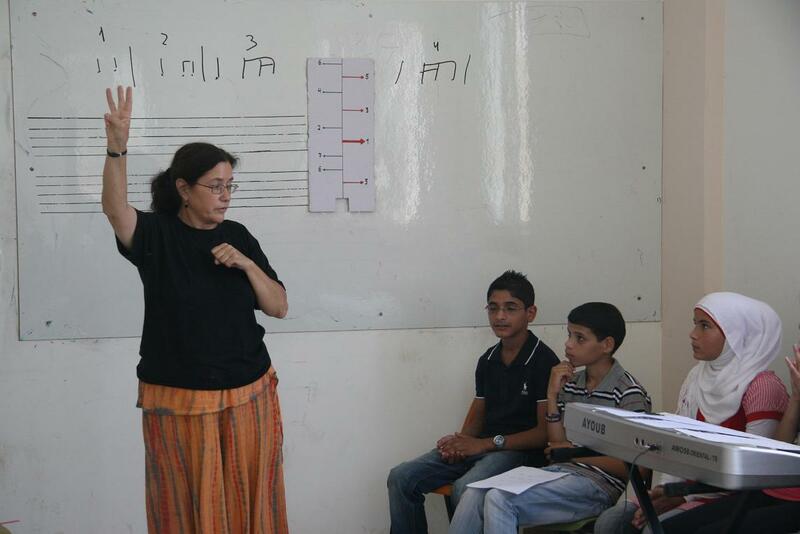 The Villages Group continues to work closely with Salem’s Music Center, leading to ever-expanding relationships between the Center and the music-education community in Israel. Below (in reverse chronological order) are descriptions of two visits from Tel Aviv to Salem that took place over the past few weeks. The opposite type of visit is far harder to arrange, although we did manage to pull one such visit off earlier this year. 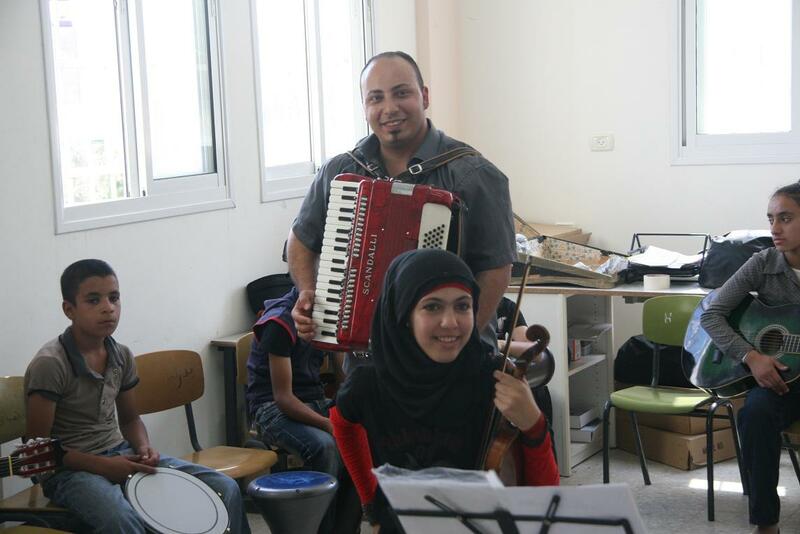 The June 24 visit (scroll down to the 2nd part of the post) was especially illuminating, since at the suggestion of a Center teacher the visitors asked the students about their feelings and opinions regarding their music lessons and the broader context of childhood under Occupation. On Wednesday, 7 July was a beautiful day to visit the new friends of the center: Ms Nellie who specializes in music and the conflict, Ehud and And Teacher Ruti. We talked about many topics related to the Center at Jubier’s house. After that we went to the place of training and Ruti has worked to give a great music lesson for kids. We gained a lot of information from the lesson. Coordinator of Salem Music Centre. On Friday June 24 we paid another visit to the Salem Music Center. The visit was initiated by music teachers Dr. Ruti Katz of Tel Aviv Municipal Arts High School A, and Dr. Dochy Lichtenstein of Levinsky College of Education, joined by Ram – the high school’s principal, Galit and Orit – lecturers at the Hebrew University, Jerusalem, Tamar and her son Daniel, Mali and her son Noam, Itamar, and Tal (teacher at the School of Visual Theater, Jerusalem), Erella, Danny, and Ehud of Kibbutz Shoval (members of the Villages Group). Itamar, Noam and Daniel are about to start 10th grade. Itamar and Noam study music at the Arts High School. The encounter began as Amid (a teacher at the Music Center) led a fun warm-up for all present – pupils and guests. Later, all the music students played a song together – “Katyushka” – chosen by the Salem teachers. Then the song “Kol Dodi” was taught. After the children of the Music Center played some of their own repertoire, we sat in a large circle and a conversation ensued. Amid suggested that we ask questions, and then Salem children would have their turn. Ruti: How do you feel about our visits? A student responded that they feel better with the present visit. Other children agreed, nodding. Ruti: Why did you decide to study music? Because I can express myself through music. I love music but also, beside the Music Center there are no activities for us in the village. At the Music Center we can meet other people. I heard the kids playing instruments so I wanted to as well. Because of the company of other kids. Because it fills up my free time. Ruti: I understand that some of you study music because it’s the only option. Imagine you could also have theater classes. What would you choose? Various children answer simultaneously – we would still choose music. Question: What about sports? Do you have any sports activity? We play on the roads. Question: And if you could play sports? Unanimous answer – We would still come to the Music Center. Question: How many of you have ever been to the beach? Most of the children never have. Question: Would you like to visit Israel? Dochy promised to take steps to organize a trip for them that would include attending an “East West” concert of the Philharmonic and Ensemble “Shesh Besh”, a visit to the beach and a tour of Tel Aviv. Ruti: How many times a week do you come to the Music Center? Ruti: Isn’t it too much? Doesn’t it affect your homework? When you do something you like, it’s fun. It doesn’t affect homework at all. Ruti: Do you practice your instruments at home? Amid (the teacher): Just this past week, the second year students began to take their instruments home. Ruti: Do you feel changed at all because of your music studies? Music studies bring order and system into our lives. Ruti: Would you like us to come again and that our students would also come and join your studies? We would like you to teach us, too. We would like to study other types of music, too. Amid asks: Are you happy in the village? Fadi arrives with lunch. The conversation draws to an end, Tal sings Saul Tchernichowsky’s “Credo” in Arabic and Hebrew, and Amid plays two songs. Assaf Oron works as a statistician and moonlights (voluntarily) as a human-rights activist and blogger. He arrived in Seattle from Israel in 2002 for studies, and for now is sticking with the local greyness, dampness and uber-politeness, while plotting his glorious repatriation to the land of eternal sunshine and rudeness. Meanwhile, he tries to explain to anyone who cares to listen, what the Occupation is and why it must be ended now, not later. Assaf is webmaster for the Israeli human rights organization "Villages Group"
Israeli Voters Upset with Bibi – But will they Upset him Back? “You have a choice! Israeli Anti-Militarists Speak” Four Israelis—Dorothy Naor, Sergeiy Sander and Eli Fabrikant, and Ofer Golani—talking about their personal histories, political views and activism in 132 short films. Israeli Occupation Builds Villas for Carmel Settlers, Destroys the Hut of their Widow Neighbor. YOU Can Do Something about it. © 2019 The Only Democracy?